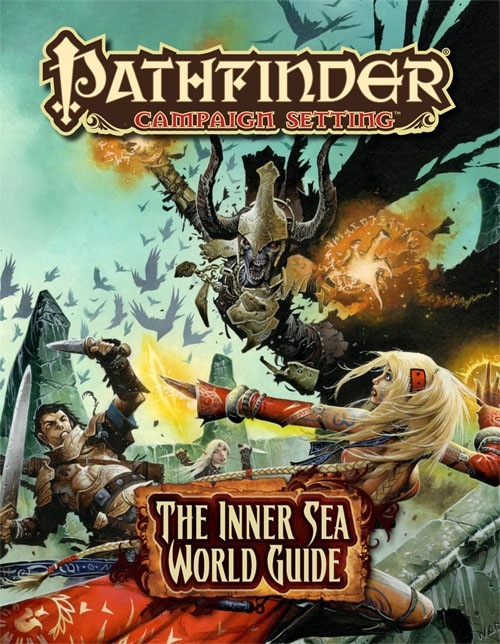 Cover art for the Inner See World Guide. Credit: Paizo. In the wake of the D&D Edition Wars, my gaming group fled fantasy for science fiction. As such I missed the previous iterations of Paizo’s Golarion setting, and I can’t speak to new versus old content, recycled art, or the other concerns that arise for gamerati whenever a new iteration of a book comes out. What I can say is the setting excited the imaginations of my D&D-jaded players – so much so, a few bought the book after paging through it and started letting it be known they wouldn’t mind returning to fantasy adventuring some day. These are to be expected, given how many at Paizo worked on the old World of Greyhawk line. Fans of that setting – or any of the old TSR D&D lines – will find plenty to like in the book. What I liked best were Golarion twists on fantasy tropes: The subterranean dwarves who fought their way to the surface in an epic Quest for Sky, driving the orcs before them; the god Aroden, whose return was foretold, and whose unexpected death brought about an era of failed prophecies; the kingdom of Razmiran, which is ruled by a false god (because in a world where mortals can become gods, what greater con can there be? ); Rahadoum, a realm of militant anti-theists who’ve banned worship of the gods in their lands. These are the sorts of twists that can reinvigorate a fantasy-weary dungeon master while simultaneously providing opportunities to bring in stories that go beyond the standard dungeon crawls, thieves guild scheming, and princesses in distress. The art is top notch; I love how the styles have been updated to the mid-18th Century. There are still plenty of medieval corners of the world, but all in all it feels more like the age of The Three Musketeers and the Curse of the Black Pearl. Swordplay and sorcery dominate the visuals, but they’re interspersed with the occasional tri-corner hat, firearm and rampaging dinosaur. I love J.R.R. Tolkien as much as the next geek, but I enjoyed that Paizo moved beyond the standard trappings with the Inner Sea World Guide. While the meat of the book is given over to detailing its 40+ countries, there’s a lot more to be found. There are one-page write-ups on each of the setting’s core gods. It’s a solid looking pantheon that covers the basics, such as Asmodeus (a god as well as lord of hell), Iomedae (goddess of honor, justice, valor), Torog (of the forge, protection and strategy), and – in yet another hat-tip to Greyhawk – Rovagug, the imprisoned god of destruction and disaster. Each entry in this section goes into great detail, providing notes on where the god is popular, notable traits of followers, and religious texts of each faith, where applicable. What I enjoyed more were the write-ups on lesser gods and godlings, like Besmara, queen of pirates; Ghlaunder, demigod of parasites and infection; Groetus, god of the end times as well as numerous demon lords, devil princes, and weird, ancient and almost forgotten gods of the First World (a primordial, fey land that exists apart from everyday reality). As someone who once played a cleric of Dalt (God of Doors and Portals) these kinds of esoteric divinities strongly appealed to me. The book’s “Life” chapter details the minutia of every day living in Golarion, including calendars, languages, trade routes, unique animals and plants. I particularly liked the sections on clockwork creations and firearms. The former provide an alternative to standard golems – they require no animating spirit to be bound to them, must be periodically “wound” using a special key, and move more quickly than stereotypically ponderous constructs. The firearms section gives Golarion some of that aforementioned Pirates of the Caribbean feel. In days past I wasn’t a fan of firearms in fantasy settings, but the arcane and divine hoops some games jump through to prevent their use is far more grating than just letting them in. I can quibble over the damage – with their ultra-low reload rates and chance of malfunction, 1d6 damage seems low for firearms – but I like the fact that these weapons can be found in scattered pockets in the setting. Much of the rest of the book is given over to the sort of rules crunch you’d expect in a d20 source book. There are 30-odd feats, many of which offer players ways to give their characters regional or thematic flair. “Andoren Falconry” gives bonuses to animal handling, while “Careful Speaker” provides bonuses to Bluff that can be handy in areas where speaking your mind can get you killed (Cheliax, Galt, Razmiran). “Rugged Northern” gives characters advantages when adventuring in arctic climates while “Green Faith Acolyte” harkens back to the world’s ancient nature-worshiping religions. There are four new prestige classes: Hellknights, the enforcers of order and law in Cheliax; Low Templars, opportunistic soldiers who’ve fought in one of the many crusades against the demon-infested Worldwound; Red Mantis Assassins, dedicated, elite killers who dabble in arcane magic, and can transform themselves into giant insects; and finally, the Harrowers, arcane casters who use Harrow cards – Golarion’s equivalent of Tarot – to divine the future and power their spells. Each serves to reinforce some aspect of the setting, and they do a good job of it. The rest of the book is given over new spells – including a Harrow spell that allows Harrowers to further manipulate reality with the draw of the card – and a number of new monsters. The monster chapter opens by spelling out how iconic monsters fit into the work, for example driders are the result of drow “fleshwarpers” exercising their craft, while serpentfolk are all but extinct. The meat of the chapter details Golarion specific creatures like the charau-ka ape-men of the Mwangi Expanse, the undead Daughters of Urgathoa, and the fearsome, projectile-firing Spine Dragon. By book’s end, readers will have discovered a rich and diverse world that can accommodate almost any style of fantasy role-playing. Some could argue that Golarion is too much of a hodgepodge, what with super-science nations, high magic, and gothic horror all being packed into the same continent, but for me that’s part of the charm. Each of its disparate backgrounds has a good reason for being, and the geography is diverse enough to keep them separate if you so wish. At the same time, there are meta threats – like the Worldwound or the Age of Failed Omens – that provide decent hooks for pulling everything together. If you’re looking for a world you can get lost in then Golarion and the Inner Sea World Guide is for you. Note: This review originally appeared at GameCryer.com and is reprinted here with permission.